VISSCHER -Orbis Terrarum Typus de Integro ..
VISSCHER, N. - Orbis Terrarum Typus de Integro ..
Orbis Terrarum Typus de Integro .. - VISSCHER, N.
Size : 12.2 x 18.9 inches. / 31.0 x 48.0 cm. Description :Exquisitely decorated double hemisphere world map, surrounded by engravings including allegorical representations of the continents as well as native inhabitants and wildlife. 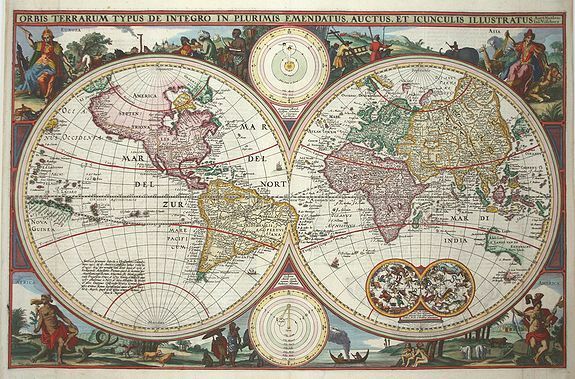 This is Visscher's first world map to be included in Dutch bibles and the prototype for the surrounding decorations that were copied by several other cartographers. Two celestial spheres are displayed in the Eastern Hemisphere. In the lower part of the Western Hemisphere is text describing the discovery of America and recent voyages of discovery. Two diagrams depicting the Ptolemaic and Copernican theories of the solar system are tucked between the hemispheres. The north-west coast of North America is exaggerated and shows California correctly as a peninsula. Parts of Australia and Van Diemen's Land are shown but the north coast of Australia is not depicted. Condition : The margins at left and right are new and added with the leafcasting methode, it is hardly notable.